Annual grass with slender erect stems of long narrow leaf blades and dense hairy flower panicles that mature to thick drooping seed-heads. Any well-drained soil in full sun. Drought tolerant once established. Hardy but thrives best in warm climates with long hot summers. 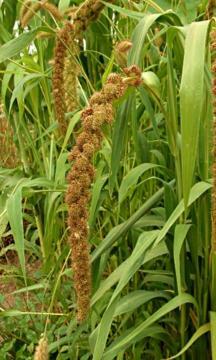 Seed is edible cooked or ground to make flour. Very commonly cultivated in many parts of the world.